The Ruby Suns, the band-ish pseudonym of nomadic Californian-New Zealander Ryan McPhun, return after four years with a brilliant record, Sprite Fountain. It began in earnest upon moving to Oslo, Norway from Auckland in 2013's twilight with impending fatherhood tapping him on the shoulder. A slowly ripening thing, it was made amidst child rearing and touring with NZ pals Lawrence Arabia. 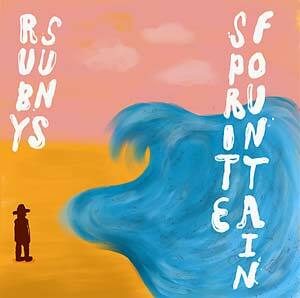 Having released on Sub Pop and Memphis Industries in the past, Ruby Suns' Sprite Fountain, a pithy nine songs running over thirty-three minutes, is stylistically an amalgam of the four previous Ruby Suns records. Rhythmically and harmonically complex, McPhun's influences are eluded to like snatches of a jukebox heard across a busy motorway. The touchstones are brief -- ELO for four bars, a hint of Julia Holter in an arrangement -- before they disappear into a kaleidoscopic tapestry that reveals McPhun to be a singular savant, hinted at by his diverse back catalog. Though harmonious in macro, there is a mania within -- a fitting analog to what is often the predicament of a new parent: constantly under-slept, delirious, and confused, yet somehow elated. Not to mention the matter of cultural isolation that comes with being an immigrant in a new country, and an antipodal one at that. McPhun has trouble relating to the "Pram Gang" he passes by on the street and grapples with Norway's political movements in "Blåhvalene". He then goes back to California with the Wilsonesque "Blankee" -- a Steinbeck-referencing ode to his teenage surf break (Ventura Point) and the almost a capella album closer "King Cake". "Gatrapa" is a Tropicalia-induced, Siri Hustvedt-quoting epistle on the inexorable parade of time, and "Tilt Of His Hat" is a jovial but bumpy supplication to an overworked and overstressed loved one. "K Rd Woody" recounts halcyon days on Auckland's Karangahape Road with its transient dive bars and cheap late night eateries, while "Waterslide" is a fuzzy cautionary tale of primitivism gone awry. Sprite Fountain was made almost single-handedly by Ryan McPhun in Scandinavia. He then moved onto Spice Boys studio in Copenhagen, with finishing touches made in a friend's 18th century villa in Chelva, Spain. Bevan Smith visited Norway with his Eventide Harmonizer and assisted with the final mix. Sprite Fountain is a treasure box of potent ideas, discrete and often discreet. A blissful, psychedelic and always totally surprising listen; with each subsequent listen revealing gleaming new attractions.